For scientific work (like my phd) i use Lyx (on windows 7, 64 bit in case this matters). Most images i draw myself using powerpoint, exporting them as emf and including them in lyx. For those, who don't know, Lyx is kind of syntactic sugar on top of latex, easing a lot of stuff as for instance image format management. Under the hood for each latex run lyx uses image converters to convert arbitary formats to something latex can handle (e.g. pdf or eps). Until may, lyx 2.1.4 used some set of command line tools (e.g. metafile2eps) to convert the images, from lyx 2.2. (may 2016) lyx switched to use inkscape for almost all image conversions. => By updating lyx from 2.1.4 to 2.2 i implicitely switched from metafile2eps to inkscape to convert emf images (without knowing about this). This completely scrambled my emf images. 2.1.) 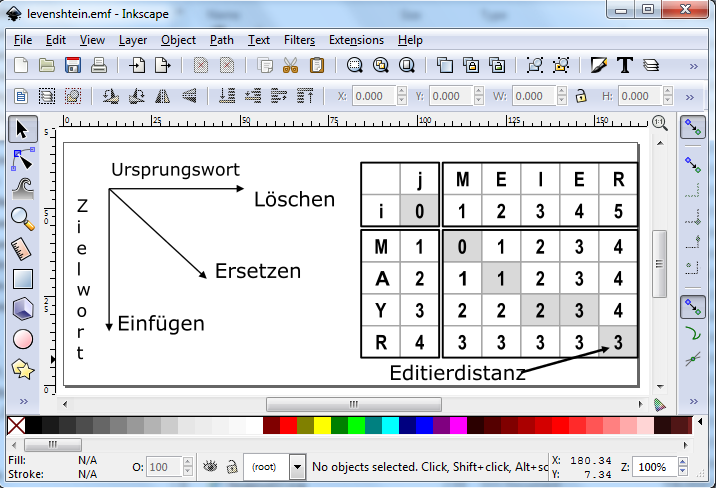 If opening the emf using inkscape, i get the same picture i see in the lyx-document (kind of a preview). There most of the drawings are retained, only all textual labels used in the emf are moved to the topleft of the image all drawn on top of other. 2.2.) 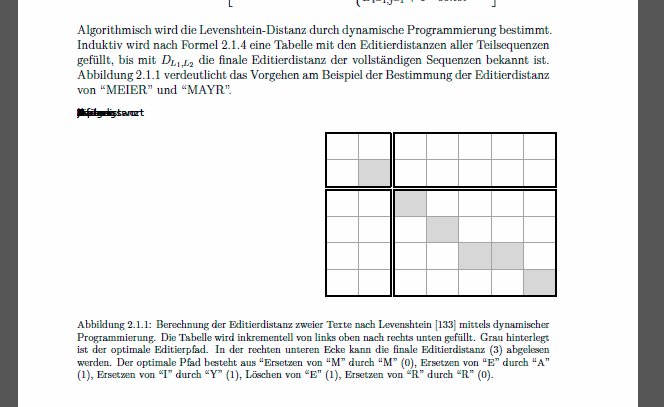 If generating a pdf out of lyx (using pdflatex) lyx seems to use inkscape to convert the emf to a pdf (which then is used by latex). I get the same picture if manually opening the emf in inkscape and then save as pdf. In this case not only bug 2.1. applies (all text is moved to the topleft). Further all text is moved further out, so that only parts of the scrambled text are visible any more AND certain lines (which were still present in 2.1. (opening emf in inkscape) just disappear. *In the correct image, in the left there are 3 arrows with 5 labels, in the right there is a table of numbers and one arrow and label pointing to one of the cells. * After saving as pdf, i see a lot of white space in the left, with just some serif edges of some letters on the very top left. all arrows are gone. The empty table is still there, but the right boundary line of the table is cut off. => in any case i am using windows 7 professional (64 bit, at home also one netbook with 32 bit) with recent updates. until last week i had office 2010 on my work laptop, now i have office 365.
inkscape is 0.91 r13725. The exe is from Jan 30 2015.
sorry for the strange situation. > ** Attachment added: "levenshtein.png"
> For scientific work (like my phd) i use Lyx (on windows 7, 64 bit in case this matters). Most images i draw myself using powerpoint, exporting them as emf and including them in lyx. For those, who don't know, Lyx is kind of syntactic sugar on top of latex, easing a lot of stuff as for instance image format management. Under the hood for each latex run lyx uses image converters to convert arbitary formats to something latex can handle (e.g. pdf or eps). > Until may, lyx 2.1.4 used some set of command line tools (e.g. metafile2eps) to convert the images, from lyx 2.2. (may 2016) lyx switched to use inkscape for almost all image conversions. > => By updating lyx from 2.1.4 to 2.2 i implicitely switched from metafile2eps to inkscape to convert emf images (without knowing about this). > This completely scrambled my emf images. I'll attach some screen shots.... Can i somehow help to track down this? > 2.1.) 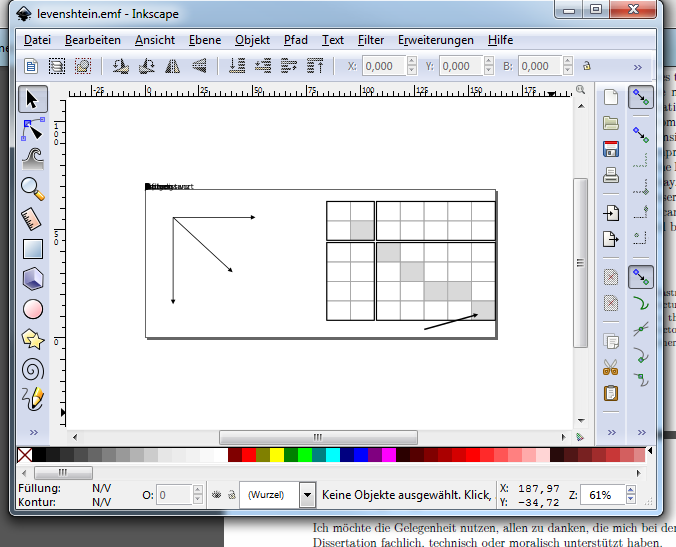 If opening the emf using inkscape, i get the same picture i see in the lyx-document (kind of a preview). There most of the drawings are retained, only all textual labels used in the emf are moved to the topleft of the image all drawn on top of other. I would suggest you do a complete search of your hard disk looking for the file inkscape.exe to see if you have more than one version present, and to confirm the inkscape rev number for each version that you find. •EMFs are now converted using another converter program (if available it is Inkscape). Therefore other results can be expected. 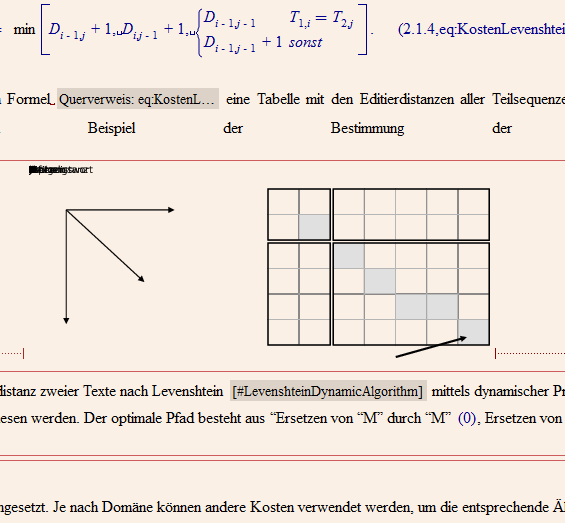 Using EMFs in laTeX documents is not a good idea. EMF is Windows-only and cannot be embedded to any output format. Thus convert the EMFs to a PDF image and you won't have any problems with different converter results (or even no result on Mac and Linux). I would recommend that you install a recent version of Inkscape, do your own, independent, conversion from emf to pdf using Inkscape, and then use that pdf output in Lyx. This will avoid confusion as to what the source of the problem is. > •EMFs are now converted using another converter program (if available it is Inkscape). Therefore other results can be expected. Using EMFs in laTeX documents is not a good idea. EMF is Windows-only and cannot be embedded to any output format. Thus convert the EMFs to a PDF image and you won't have any problems with different converter results (or even no result on Mac and Linux). => 2 thoughts about this. 1.First of all, this was the first reply out of 4, and all the others knew and recognized that lyx's ability to eat whatever image formats you'll feed it is a value in itself, as it automates tedious and error prone manual labor. If i'll change my drawings a tiny bit (which happens very often with over 100 drawings), i don't want to go through a long manual process there all the time. And for the choice of the format - it is the only reasonable vector graphics format power point can export. And emf is never used directly in latex, it is automatically converted by lyx (using helpers like now inkscape). 2. I just filed a bug on inkscape after we realized after long discussion that this is an inkscape and no lyx issue. Do you want to tell me, that the behaviour i observe using a fresh install of inkscape is correct (i.e. no bug)? > source of the problem is. 3. I just did this and see exactly the scrambling i observe when using lyx. - which version of Inkscape? You can find this out at the menu item Help->About. - can you attach the svg file you obtain when you load your emf file into Inkscape? > - which version of Inkscape? You can find this out at the menu item Help->About. The bug seems to depend on some state of inkscape. (Before i always saw the bug on all machines, yesterday i had 15 minutes, where inkscape did the right thing - then switching back to the bug without changes on my side) In case this helps, i'll specify my inkscape related handlings and observations. * On all(?) machines (except the fresh installation of the first one) i first installed Lyx2.1.4 (the version without inkscape), much later inkscape 0.91 to work with xps-files which i online converted to pdf and then edited in inkscape. This worked and still works. * At this point in time i did not test the handling of emf files. * Then I installed Lyx 2.2. (which uses and brings(?) inkscape for image conversion) Not sure, what exactly they do with inkscape. For the smaller converters of lyx 2.1.4, those were just put in a private subdirectory of the lyx-directory. I don't know if they recognize the inkscape installation and leave it like it is or do a private installation of inkscape. * Then i realized, that my generated pdf was scrambled, later i realized that this mostly because of scrambled (and shrunken - which probably is a feature and not a bug) emf images. * Then i investigated and found inkscape as the program in charge. I tried manually to open the emf's and saw the described error (scrambling of texts when opening, more scrambling and removal of lines when saving as pdf). * After my fresh install some days ago, i installed inkscape 0.91 and lyx 2.1.5. (don't know in which order). Had no time to play with inkscape. Yesterday - just before filing the bug - i tested again and saw the bug. After your first reply yesterday ("...not reproduced on 0.91...") i tried myself and for 15 minutes inkscape did the correct thing (i did not change my actions and luckily in the recycle bin i still found a garbled pdf from before filing the bug). * Then i thought about if this lucky state change might also have solved my problem with lyx (even if it did i would not know how to cure the rest of the laptops or later installs). So i installed Lyx2.2. => the images were still scrambled. I then tried again to open the emf in inkscape - and the bug was there again (doing exactly what i did 15 minutes before - open inkscape, file->open ... emf (and later save as pdf)* Now the bug is again present on all my machines. Well, I am at a loss, don't know what is going on. However, two things that should be tried. - second, do an Inkscape re-install to make sure that Inkscape is the most recent installation, just in case lyx is accidentally overwriting some of the Inkscape libraries. 4. Without ever starting lyx i repeated my experiments of 2. Texts should be shown in the correct positions now. Please check if there are any regressions, otherwise I'll push to 0.92.x soon. The only issue remaining (as far as I can see) are the arrows that are still missing in the PDF output.